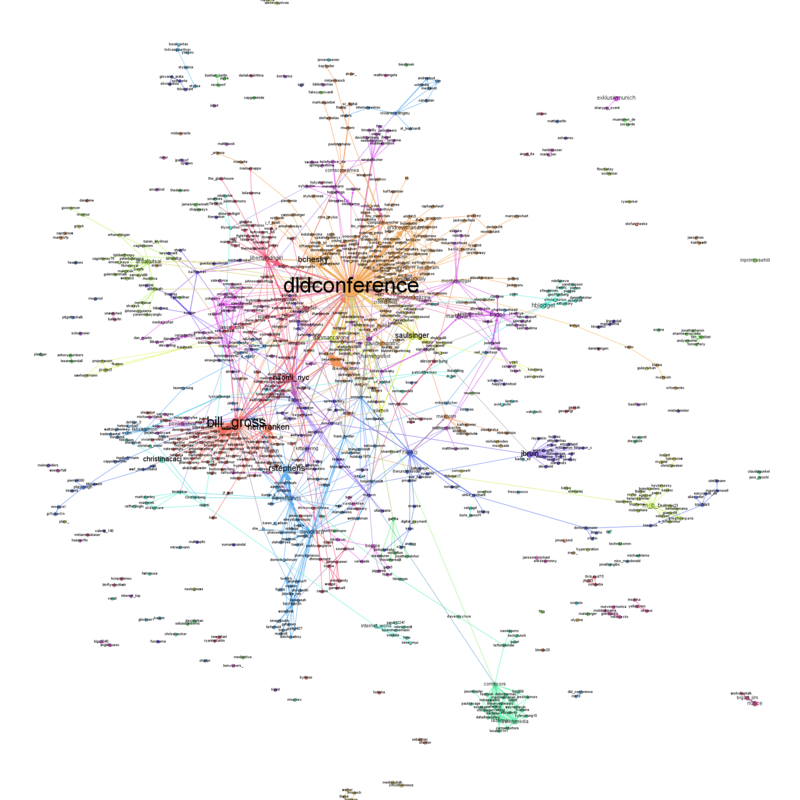 DLD Conference – what were Twitter users discussing? Author Benedikt KoehlerPosted on 27. 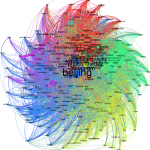 January 2012 Categories gephi, network analysis, twitterTags analysis, automap, burda, content, DLD, dld12, gephi, network, python, radian6, salesforce, semantic, text mining, twitterLeave a comment on DLD Conference – what were Twitter users discussing? 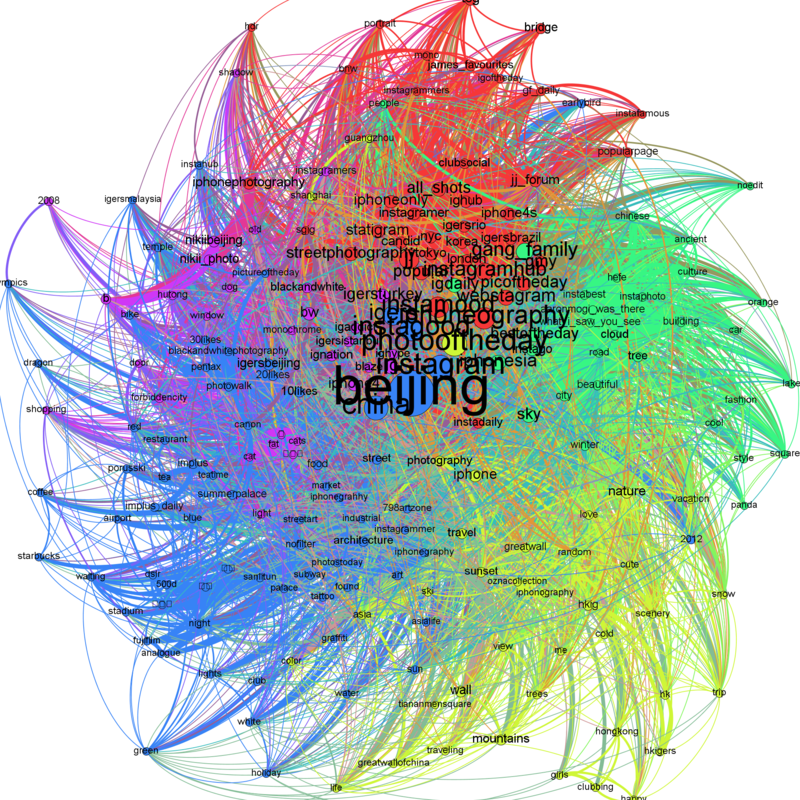 One thing is very obvious from this structure: The WEF is much more of a news media event than the DLD (see the visualization of the DLD network from the day before the event). There are two very densely populated clusters of journalists from Reuters (red in the top right of the map) dominated by @rtrs_biztravel, @reuters_davos and journalist @reuters_davos and another BBC cluster (light brown on the right) dominated by @bbcworld. 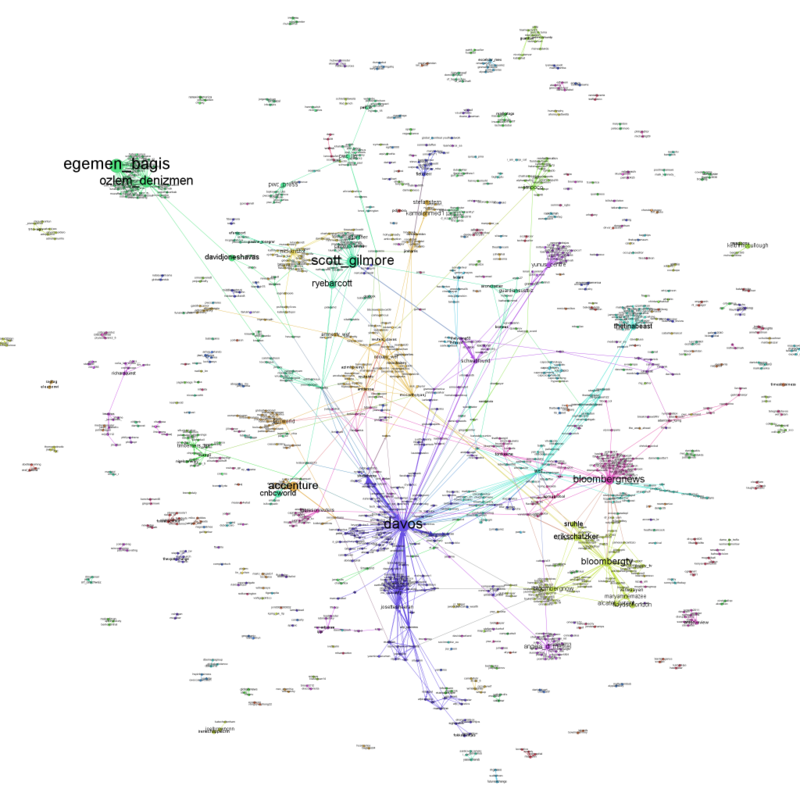 And there is also the guardian (deep blue on the bottom left) Other actors that have influential network positions are @worldbank and (this could become interesting) @occupy_wef. 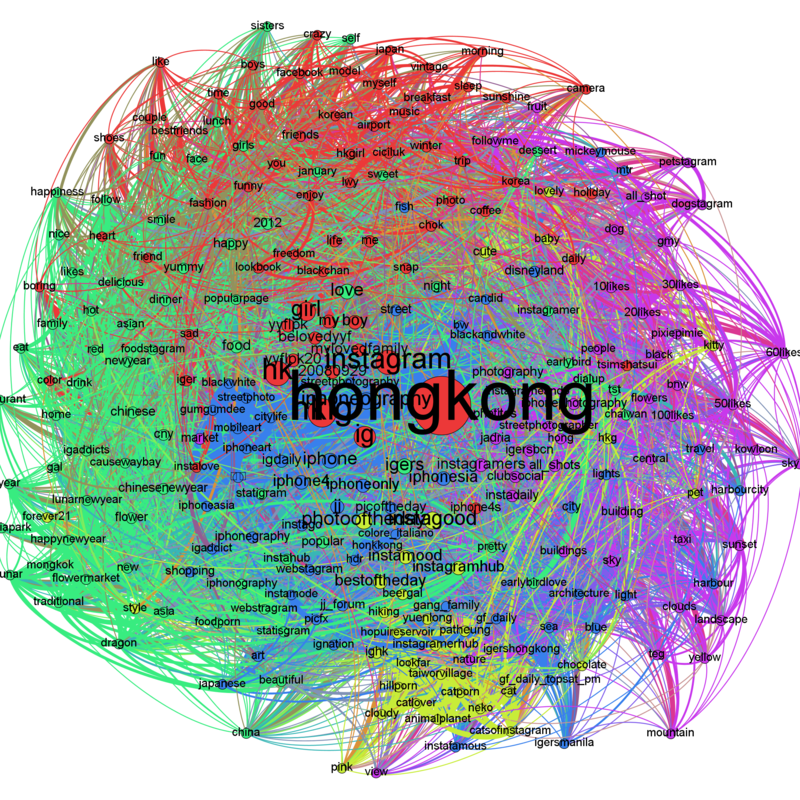 All in all the buzz generated by #WEF and #Davos appears to be significantly larger than the DLD related buzz. 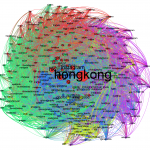 Most frequently mentioned are: @davos (222 mentions), @bbcworld (94), @worldbank (58), @reuters_davos (49) and @wef (44). Most active users are Bloomberg’s @tomkeene (16 Davos tweets), @loupo85 (10), journalist Ken Graggs @betweenmyths (8), Reuters Social Media editor @antderosa (7) and Schwab Foundation @schwabfound (7). 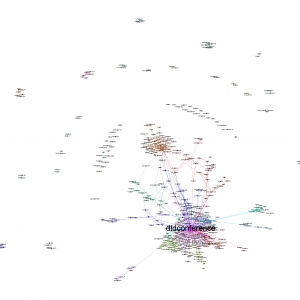 Now, the Reuters and BBC clusters that dominated the Twitter discussions in the morning, have somewhat dissolved. Instead, there are new clusters centering on Bloomberg (light green and pink on the right), Angela D. Merkel (violet bottom right) – which by the way is not the official account of the German chancellor -, Yunus centre (violet at the top), Scott Gilmore (green at the top) and a very dense minicluster of Turkish EU affairs minister Egemen Bagis and Ozlem Denizmen (green at the top left). So it’s definitely starting to get more political 😉 The Occupy WEF cluster has been joined (structurally) by Amnesty WEF and has been connected (or interwoven) to the former Reuters cluster. 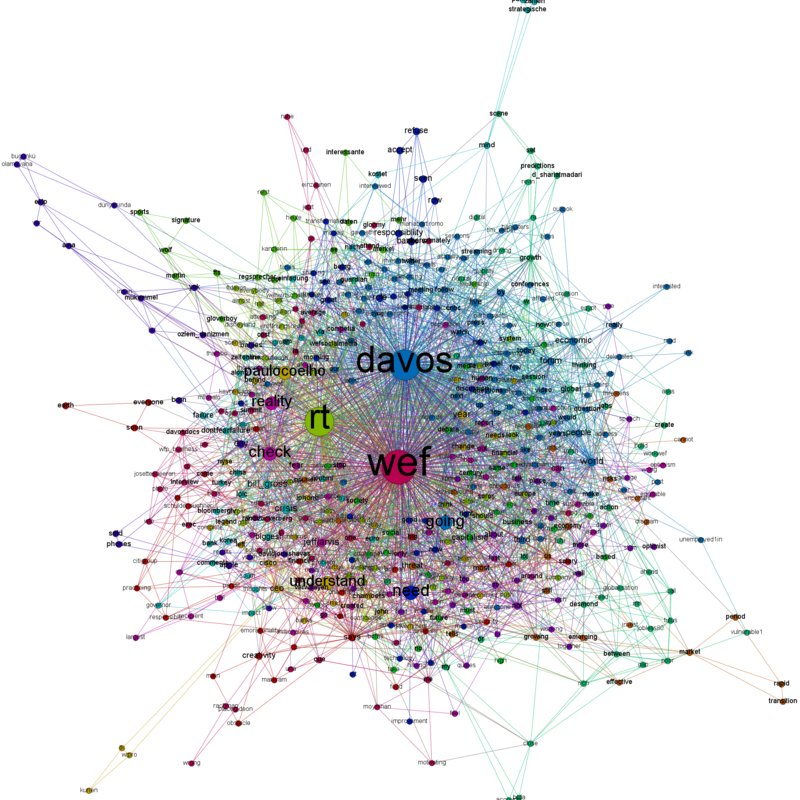 Here’s a list of the most frequently mentioned Twitter accounts in conversations with the hashtags “#WEF’ or ‘#Davos’: @davos (109 mentions), @ozlem_denizmen (45), @bloombergnews (43), @egemen_bagis (39) and @wef (36). The most active conversationalists are: @competia (12 posts), @antderosa (11), @mccarthyryanj (9), @wfp_business (9) and @sachailichopra (9). 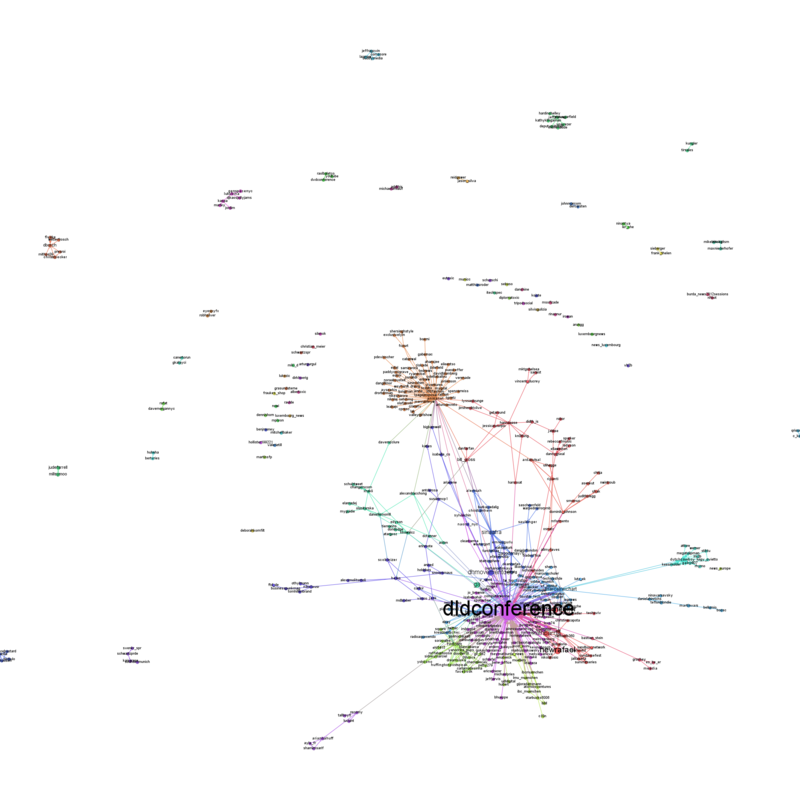 Now take a look at the next visualization that captures the Twitter activity from afternoon to midnight on the first DLD day: The difference to the first network is striking. Now, @DLDConference has lost some influence – which is good because it’s not a good sign if the official conference account is the only one posting Tweets about a conference. 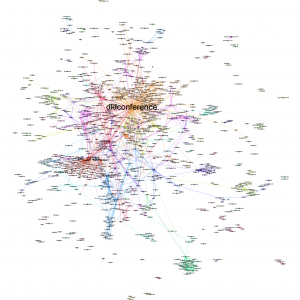 And there are new people who are mentioned very frequently: @DLDConference (106 mentions), @bill_gross (84), @jack (70), @martinvars (31) and @jeffjarvis (31). 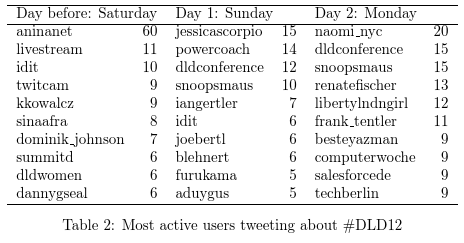 The most active users were @jessicascorpio (15 tweets), @powercoach (14) and @DLDconference (12). 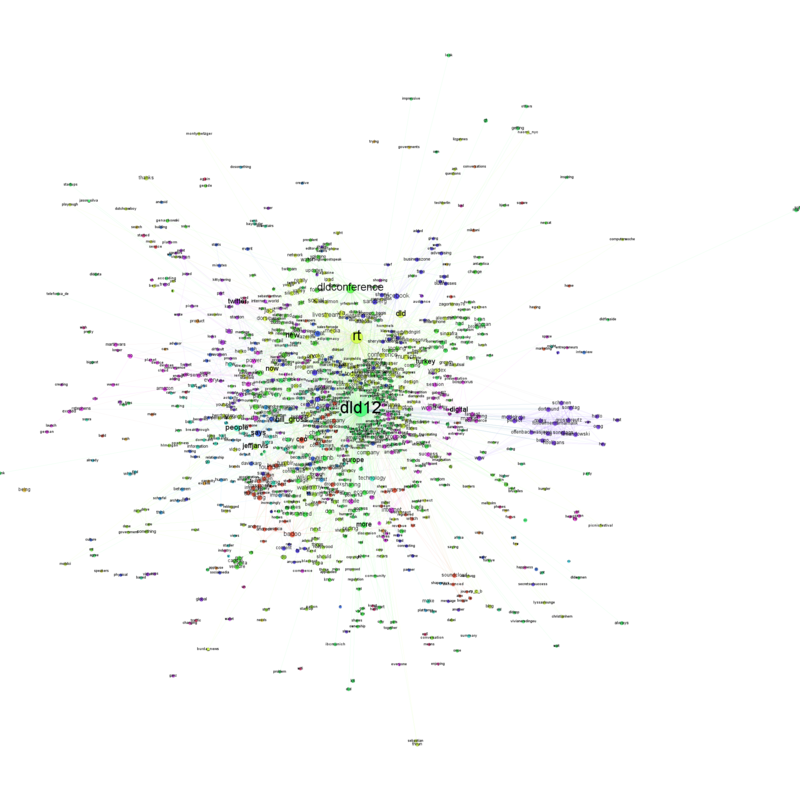 The size of the nodes in this visualization is the account’s page rank. The higher the page rank the higher the probability of reaching this node by chance while traveling through the network. Nodes with a high page rank have a high influence in the network. 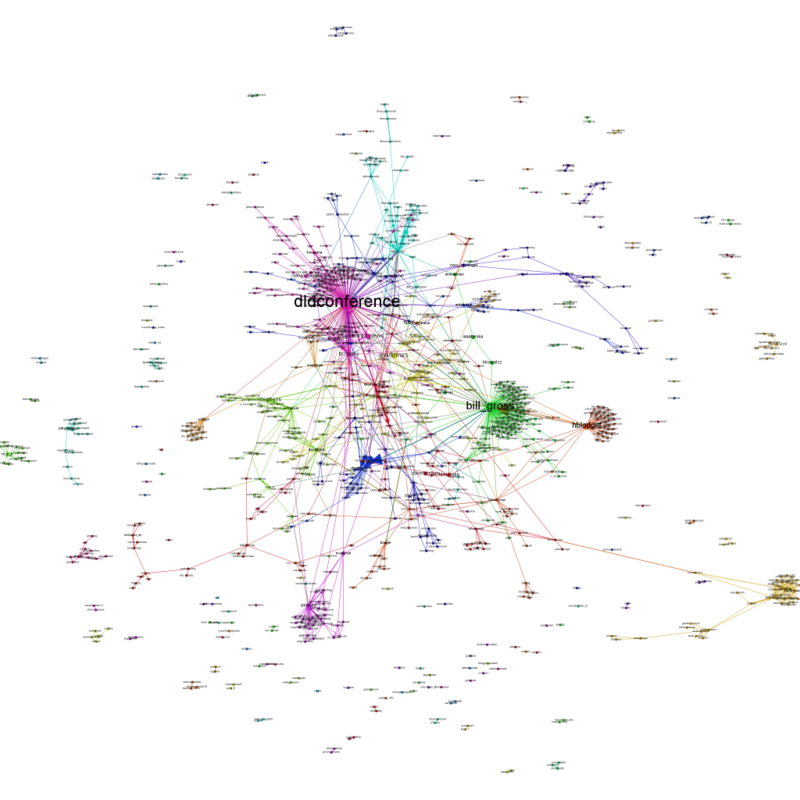 Nodes with a very high page rank were: @DLDconference, @lindastone, @hlmorgan and @bill_gross. The width of the arrows reflects the number of times one Twitter account has mentioned or retweeted another account. The strongest links were: @powercoach mentioning @jack, @burda_news mentioning @DLDConference and @mammonaetheevil mentioning @alecjross. Finally, here’s a quick glance at the network for Monday. 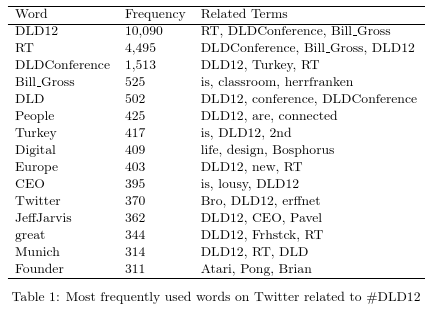 All DLD-related tweets from 0:00 until 16:00 have been counted and analyzed. 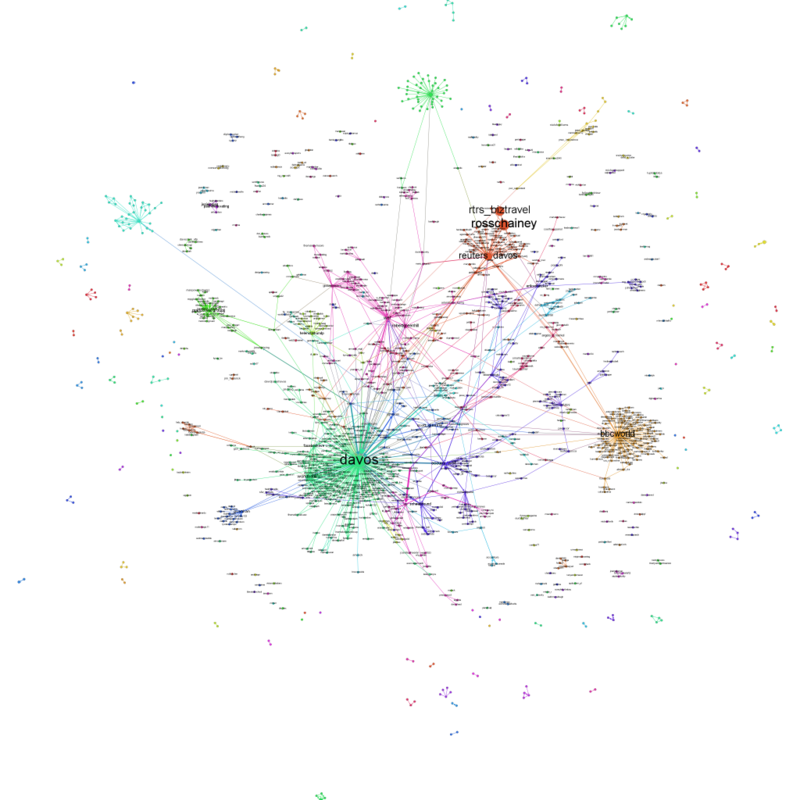 The network is getting more and more dense. Tomorrow I’m posting another update with the remaining Monday and Tuesday tweets and I’ll take a look at the content posted by the users. Read the update in part 2 of the article. The first thing that came to my mind when looking at the many options, the API is providing to developers, has been the tags. In the Instagram application, there is no separate field for tagging your (or other peoples’) images. Instead you would write it in the comment field as you would do in Twitter. But the API allows to fetch data by hashtags. 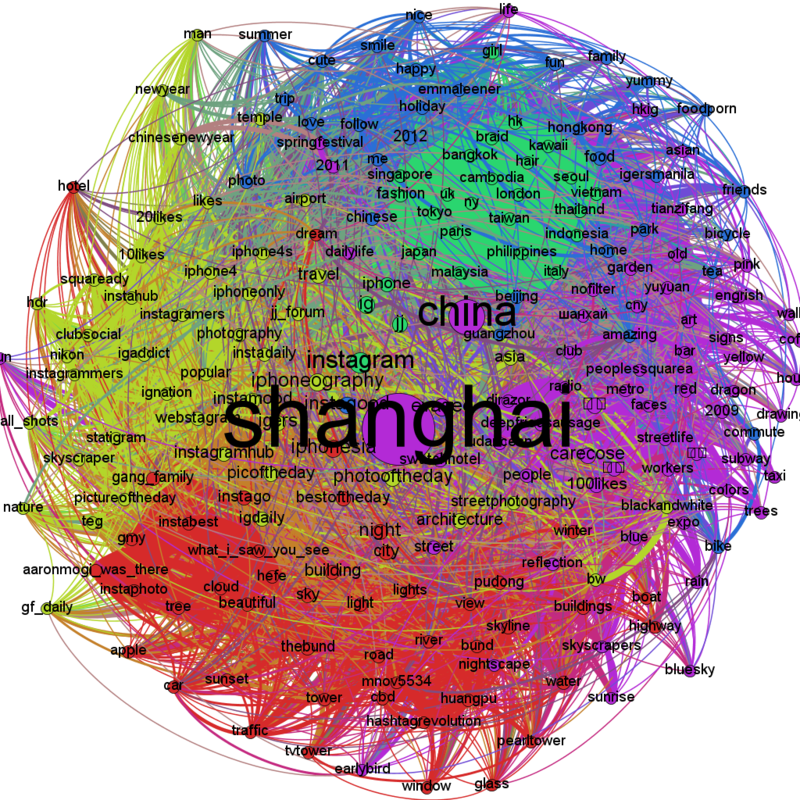 After reading this fascinating article (and looking at the great images) in Monocle about the northern Chinese city of Harbin, I wanted to learn more about the visual representation of this city in Instagram. 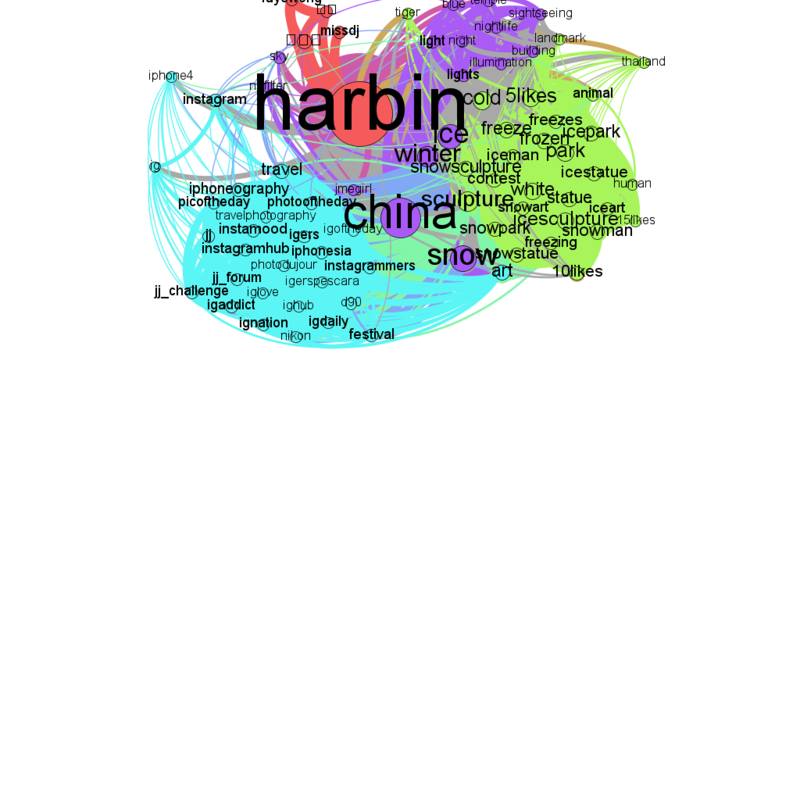 The first thing to notice is that Harbin obviously is not as often being instagrammed as the Shanghai, Shenzhen, Hongkong or Beijing. An interesting indicator here is in the second data column: the daily number of images tagged with this location. 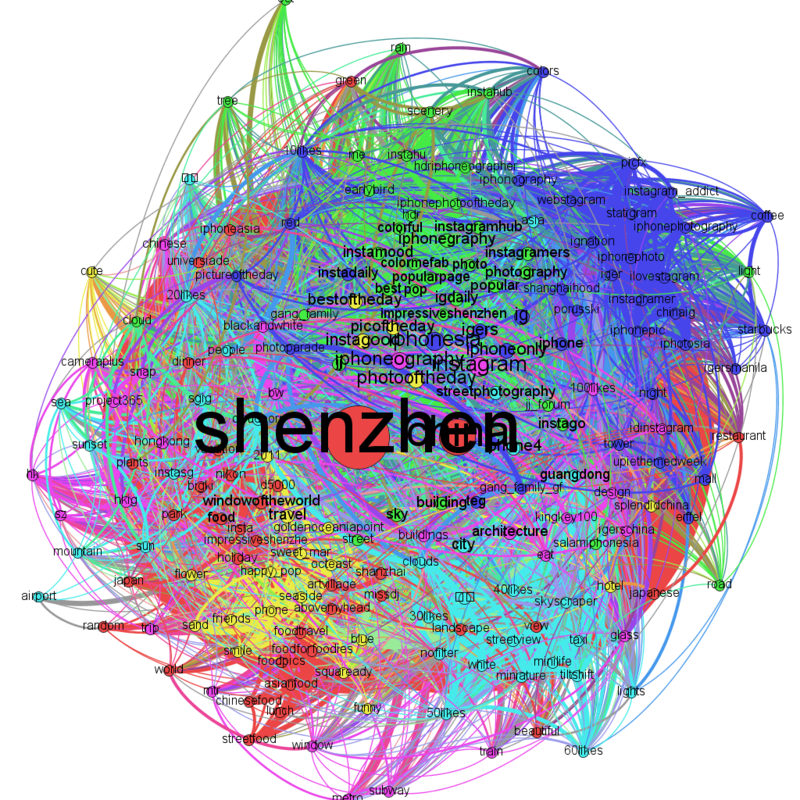 Shenzhen seems to be the most active city with 3.4 images tagged “#shenzen”. 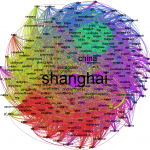 Beijing is almost as active, while Shanghai is a bit behind. Finally, for Harbin, there’s not even one image every day. The unique tags is showing the diversity of hashtags used to describe images. Here, China is clearly in the lead. The next two indicators tell something about the connections between the tags: The density is calculated as the relation of actual to possible edges between the network nodes. Here, the smaller network of Harbin has the highest density and China and Shanghai the lowest. The average path length is a little below 2 for all hashtags. Finally, here is the most frequently liked image for each of the hashtags – to remind us that the numbers and networks only tell half the story. Enjoy and see if you can spot the ice sculptures in Harbin! One of the most important market research buzzwords in 2012 will be big data. Even the future of a large Internet company like Yahoo! can be reduced to this question: What’s your approach on big data (AdAge published an interesting interview with new Yahoo! CEO Scott Thompson about this topic). At first glance, this phenomenon does not appear to be new: There are large masses of data waiting to be analyzed and interpreted. These data oceans have been there before – just think of the huge databases of customer transactions, classic web server log files or astronomical data from the observatories. Democratization of technology: The tools that are needed to analyze terabytes of data have been democratized. Everyone who has some old desktop PCs in his basement, can transform them into a high-performance Hadoop cluster and start analyzing big data. The software for data gathering, storage, analysis and visualization is more often than not freely available open source software. For those that don’t happen to have a lot of PCs around, there’s always the option of buying computing time and storage at Amazon. 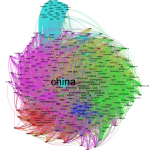 A new ecosystem: In the meanwhile there is a very active global scene of big data hackers, who are working on various big data technologies and exchanging their use cases in presentations and papers. If you look at the bios of these big data hackers, it becomes apparent that this ecosystem is not dominated by academic research teams, but data scientists working for large Internet companies such as Google, Yahoo!, Twitter or Facebook. This clearly is a difference to e.g. the Python developer community or the R statistics community. In the moment people seem to be moving away from Google, Facebook and the like and joining the ranks of specialized big data companies. Network visualization: Visual exploration of data has become almost as important as the classic statistic methodology of looking for causalities. 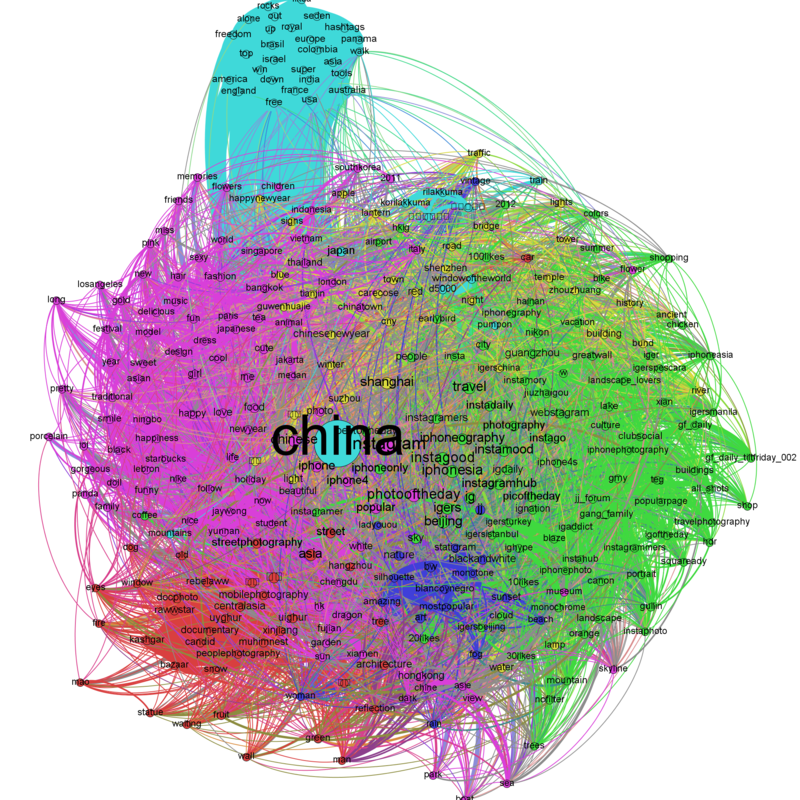 This has the effect that social network analysis (SNA) has gained importance. 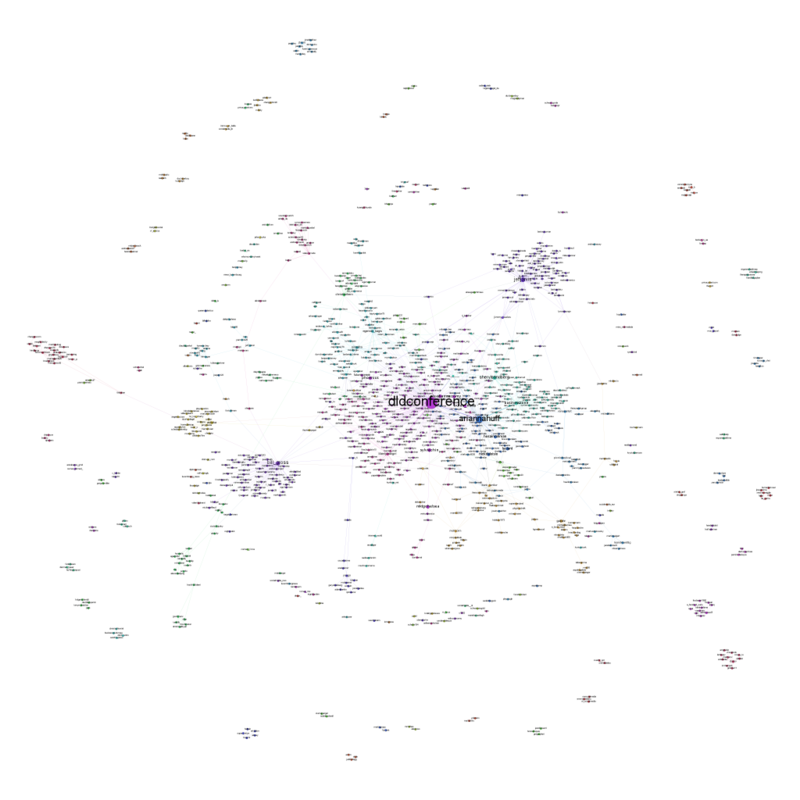 Almost all social phenomena and large data sets from venture capitalists to LOLcat memes can be visualized and interpreted as networks. Here again, open source software and open data interfaces are playing an important roles. 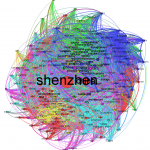 In the near future, software such as the network analysis and visualization tool Gephi can connect directly to the interfaces (APIs) of Facebook, Twitter, Wikipedia and the like and processed the retrieved data immediately. New skills and job descriptions: One particular hot buzzword in the big data community is the “data scientist”, who is responsible for gathering and leveraging all data produced in “classic” companies as well as Internet companies. On Smart Planet, I found a very good description of the various new data jobs: There will be a) system administrators who are setting up and maintaining large Hadoop clusters and ensure that the data flow will not be disrupted, b) developers (or “map reducers”) who are developing applications needed to access and evaluate data, c) the data scientists or analysts whose job is telling stories with data and to craft products and solutions and finally d) the data curators who watch over quality and linkage of the data. 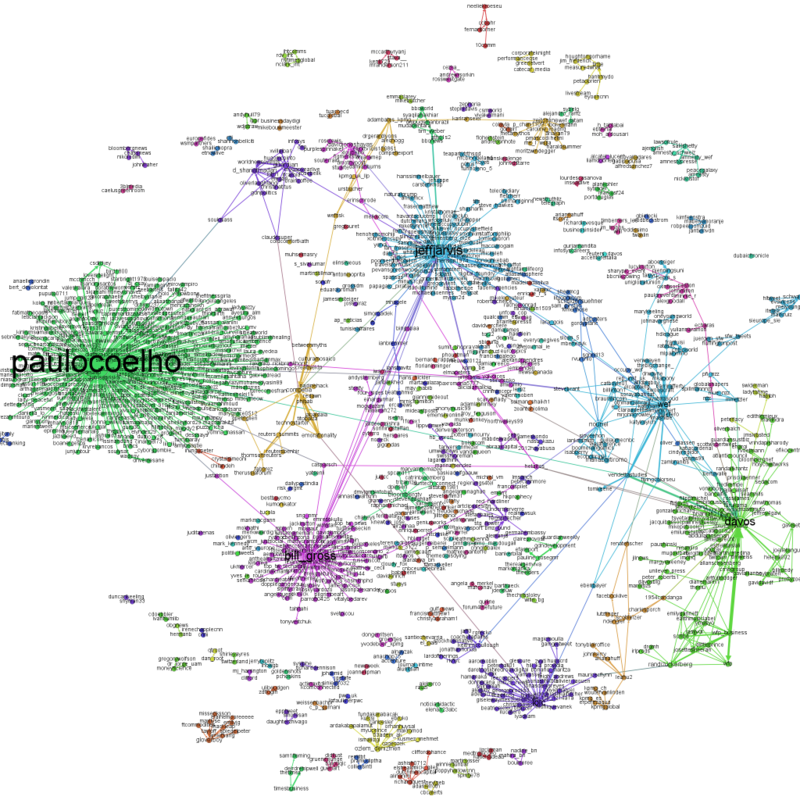 To gain a better understanding of how the big data community is seeing itself, I analyzed the Twitter bios of 200 leading big data analysts, developers and entrepreneurs: I transformed all the short bios into a textual network with the words and concepts as nodes and shared mentions of concepts as edges. So, every time, someone is describing himself as “Hadoop committer”, there will be another edge in this network between “Hadoop” and “Committer”. 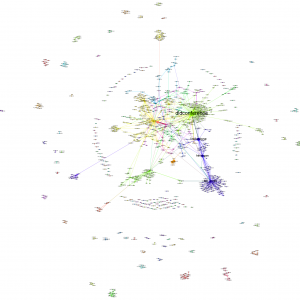 All in all, this network encompasses 800 concepts and 3200 links between concepts. To explore and visualize the network, I reduced it to approximately 15 per cent of its volume and focused on the most frequently mentioned terms (e.g. 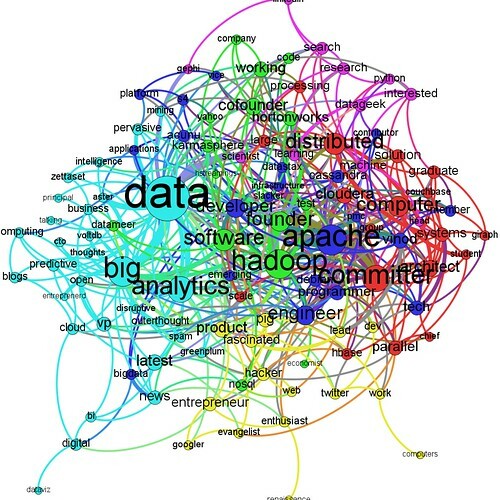 Big Data, founder, analytics, Apache, Hadoop, Cloudera). The resulting visualization made with Gephi can be seen above.